What do a barrel pump and a smartphone have in common? At ACHEMA we could introduce this innovation. Inform yourself about the world’s first drum pump that implements the Industry 4.0 standard so that pumps can be interlinked in the future with state-of-the-art information and communication technology. The driving force behind the new development was the increasing digitization in society, which also influences the production. The intelligent drum pump provides the user with all relevant operating data of the pump in real time and saves it. In addition the user can retrieve all product data sheets such as leaflets, spare parts lists, operating instructions and chemical resistance lists as well as the entire pump history at any time on the smartphone, tablet or laptop. 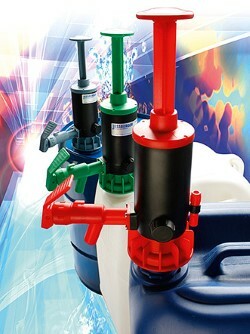 The user is thus enabled to closely monitor and archive the entire filling processes and pumps. While over here is no need to worry about whether water is available for drinking 24 hours a day, there are regions in the world where clean drinking water is absolutely not self-evident. It was a great honor and pleasure for us to present our new “International Sales and Marketing Manager” at ACHEMA to our customers and representatives. He has more than 40 years of experience in the international pump sector and nearly 30 years of experience in the barrel pump sector. Although he has been a competitor of ours for a long time, we have always valued his diligence, strategic thinking and demeanor, as well as his extraordinary character. We are very happy and proud to have you in our team in the years to come. In June 2016, our company made a first acquisition in the field of pumps and acquired the business and tools for the following hand pumps. The new electrical Ex-motors in 400, 600 and 800 watts are approved according to the latest standards (ATEX directive 2014/34/EC as well as IECEx) and offer in combination with a stainless steel pump tube the highest safety when pumping flammable media or use in hazardous environments. With a complete drum emptying pump tube in stainless steel neutral, slightly aggressive, dangerous and economically valuable liquids can be transferred nearly completely out of drums and containers. By a handle below the hand wheel the pump foot can be closed. This prevents that the medium can flow out of the hose and the suction tube back into the drum after motor has been switched off. 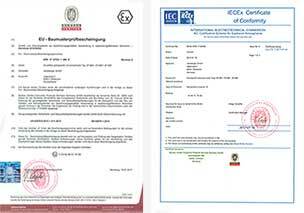 EC type examination certificate number ZELM 09 ATEX 0424X Ex II 1/2 G c IIB T4. Cause of the fact that with a remaining quantity of 0,1 l only minimal residues remain inside the drums and containers the medium can be used optimally. Especially no additional costs or time incur required for emptying the containers in another way. Pump tube in stainless steel 316Ti with complete drum emptying function and mechanical seal. The motors JP-180, JP-280, JP-360 and JP-380 and the air operated motors have proven themselves as drives for the complete drum emptying pump tubes. The pump tube length 1,000 mm is used when emptying 200 liter drums. The pump tube length 1,200 mm is used when emptying containers. In contrast to the sealless pump tubes that can be used in 95% of all applications and that can run dry cause of its construction, drum pumps with mechanical seal are not allowed to run dry. Optimal container emptying and product use. Remaining quantity of 0.1 liters per barrel. No leakage when moving the pump to another drum. No additional costs incur when emptying the drums in another way. Attention: The pump tubes with mechanical seal are not allowed to run dry.